TriActive America (http://www.triactiveamerica.com), the nation's leading outdoor fitness equipment company, announces the Accessible Multi-Gym product line. The new products are designed for exercisers in wheelchairs, users with limited mobility, and individuals undergoing physical therapy. Accessible Multi-Gym Version A includes a Shoulder Wheel, Hand Bike, Foot Bike, and a Foot Press. These items improve flexibility, coordination, strength, and cardiovascular health. Accessible Multi-Gym Version B features the Pec Fly, Rower, Shoulder Lift, and Handle Rotator. This version focuses on increasing strength and flexibility. Also available is a customizable Accessible Multi-Gym. This option offers the customer the opportunity to choose any four of the eight functions available: shoulder wheel, hand bike, foot bike, foot press, pec fly, rower, shoulder lift, and handle rotator. "I think that the health care crisis in this nation has started people looking at ways to improve their health as much as possible. There is a new wave of enthusiasm about the physical, mental, and spiritual benefits of daily exercise," TriActive America CEO James P. Sargen stated. "TriActive Fitness was developed to help people with their weight and mobility issues," reflected Sargen. "As we expand our product line to serve those individuals even more effectively, we hope to respond to the general public's desire to become healthier by improving their general fitness. I'm encouraged by the fact that the TriActive America equipment is now installed in almost every state in the nation, as well as overseas." Also available as of fall 2009 are a new strength piece, the Squat Press, and a new cardio product, the Recumbent Bike. An innovative and versatile addition to TriActive's Strength collection, the Squat Press uses the same progressive resistance for an efficient resistance workout - the farther you extend, the more difficult it gets. Safer than free weights, the Squat Press can be used to perform biceps curls, shoulder shrugs, traditional squats, and the intense squat-into-shoulder-press. Designed for all levels of fitness, the recumbent bike offers the cardio benefits of cycling while providing for full back support. Additional recumbent bike benefits include the larger, more comfortable seat; the low impact, ease-of-use pedaling action; and the strengthening effect on the inner thighs, glutes, calves, and even abs. TriActive America also recently introduced their Made in the U.S.A. eco-Friendly TriActive Fitness E-Line. Made of recycled steel and e-coated for extended durability, the nine new E-Line outdoor exercise products are designed and manufactured in the United States. TriActive America has been awarded contractor status for the U.S. General Services Administration (GSA) Schedule for the TriActive Fitness E-Line. The nine products comprising the E-Line product family are GSA-approved. 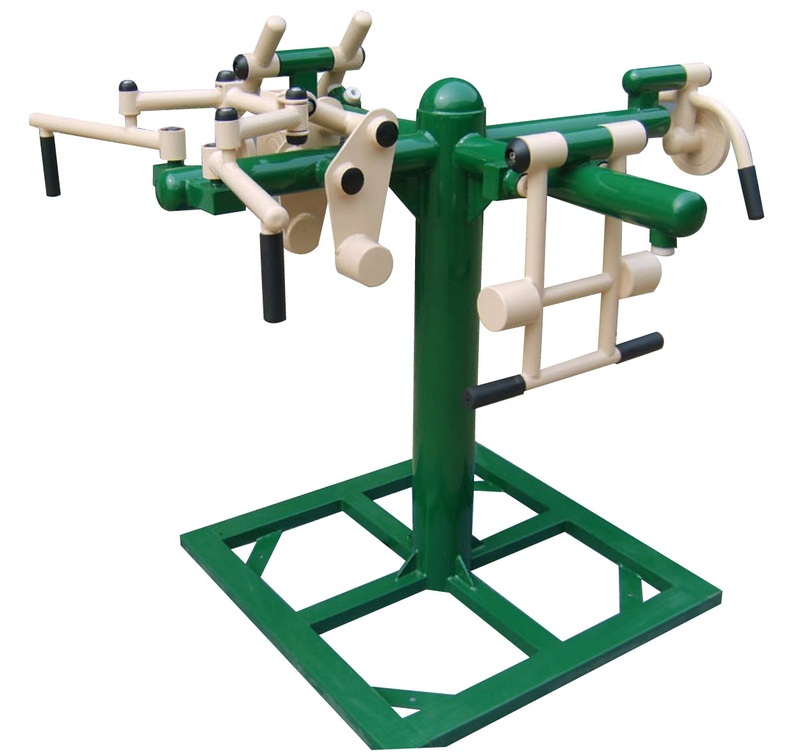 The goal: to provide designed and manufactured in the United States environmentally friendly exercise equipment with extended durability and warranty. The new TriActive Fitness E-line products are suitable for fitness zones, fitness trails, parks, schools, outdoor gyms, organizations, medical centers, hotels, and recreational areas. The first introduction of this new exercise line features nine products in all different types of fitness categories: cardio, strength, flexibility, balance, and coordination. Manufactured in Michigan, with the protective e-coating and powder coating added in Chicago, the new TriActive Fitness E-Line outdoor exercise products are designed and made in the U.S.A. of recycled steel. "The recognition from GSA that we now produce outdoor exercise equipment of such high caliber that we qualify to sell it directly to the government is monumental with regard to the growing success and achievement of TriActive America," said Sargen. The GSA develops government contracts with companies such as TriActive America. This process helps government offices, agencies, and entities to expedite the ordering of products and services that have been carefully reviewed and pre-approved as worth the money. TriActive America received the contract award under Authorized Federal Supply Schedule 192-08 Fitness Equipment, GSA Contract Number: GS-03F-0098V. The new TriActive Fitness E-Line, together with the three new products and the traditional TriActive Fitness outdoor exercise equipment, are now available. For more information and a free catalog on this great opportunity, contact TriActive America at 1-800-587-4228, visit the Web site (http://www.triactiveamerica.com/), or email staff(at)triactiveamerica(dot)com. TriActive America's eco-friendly outdoor fitness products are designed for a range of environments and are installed in parks, schools, hospitals, corporations, resorts, hotels, military bases, organizations such as YMCAs, hotels, residential communities, around community lakes, and along fitness trails. All types of exercise products are available from TriActive, including cardiovascular, strength-training, balance, flexibility, and coordination equipment. The leading source for high-quality outdoor exercise equipment, TriActive America has been awarded contractor status for the U.S. General Services Administration (GSA) Schedule for the TriActive Fitness E-Line, which is designed and manufactured in the United States and GSA-approved. Today's exercisers want fitness products that are effective and environmentally friendly, and TriActive America has succeeded in meeting that challenge. Requiring no electricity, TriActive America fitness products rely solely on "people power!"